Congratulations on your nursing degree; what a wonderful profession you have chosen! Now it’s time to celebrate you and your future career so check out these nursing graduation party ideas for making the celebration fun and special! Every celebration starts with an invitation! Of course, an occasion as special as graduating with a nursing degree deserves professionally printed announcements that reflect such a significant accomplishment. The Nursing Degree Graduation Announcements feature a traditional design in faux gold foil on the front and four different layout choices on the back. You can even choose to have one or more photos featured on the back. We chose a black and gold theme with some gold glitter accents like the table confetti from Etsy. Sprinkle this confetti on your party tables and maybe add a few photos, and guests will have something to browse as they mingle. 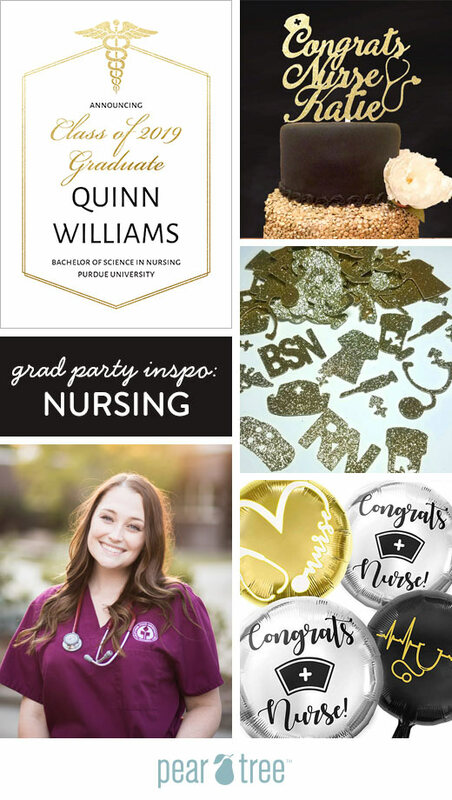 We also LOVE the Mylar balloons with nursing designs from Amazon because they’re affordable and they add flair to any nursing graduation party. Dessert is really the best part of any party, right? Whether you choose a classic but affordable sheet cake from your local grocery store or something fancy from your local master baker, make sure whatever you get celebrates your accomplishment. The layered cake shown has an awesome cake topper in gold glitter personalized with the graduate’s first name. What a great way to celebrate this very special occasion!